You can learn something from every experience, and the Creating Impressions project was no exception. My project paid homage to the fantastic design work in National Geographic Magazine. I had the chance to study the design evolution of the magazine and learn about the Magazine Publishers of America. As the deadline for submitting the art work was drawing near, I was putting some serious thought into a project theme. I was sitting on the couch, casually flipping through the latest National Geographic magazine when I realized how well the magazine is designed. I knew this was a theme I could build on. I started my research by looking through my collection of old Geographic magazines. The design had come a long way since since the first issue. 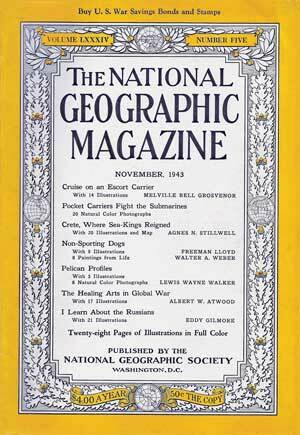 The book Graphic Design Today provides a few interesting design history facts about the magazine cover. The familiar yellow border and oak leaves and acorns “first gracing the February 1910 issue, was so successful that it remained intact with only minor modifications for nearly fifty years.” The designer given credit for this design is Robert Wier Couch of “Matthews-Northrups Works of Buffalo”. They were a “leading engraver and printer” of the time. The book also mentions that the first cover photograph is on the July 1943 edition, which is one I have in my collection. Too bad it is not in good condition. If I remember correctly, the oak leaf border started to disappear during the 70’s and were pretty much gone by 1979. The awards tell me that I was not alone in my high opinion of their magazine design. Good design has value because it delivers a pleasurable reading experience. Many people rave about the fantastic photo journalisim in National Geographic, but it is the designer that presents it with high impact. The design project will be on display at Studio Place Arts in Barre until November 8th. Be sure to swing over to Barre and check it out. There is a fantastic stone sculpture art display on the first floor that is worth seeing. I noticed several interesting restaurants near the gallery if you wanted to combine your visit with a night out. I recently discovered a stock photography Web site that I am impressed with. The site is istockphoto.com and is what I would consider a Web 2.0 Website. The stock photo inventory are from Website members. Perhaps this is why the photos are actually affordable! A large photo suitable for most print project sells for 10 credits, which costs $13. I remember a great article about stock photography by Stephen. He discussed the pros and cons of using stock photography verses photos you take yourself. I found istockphoto.com when working on our spring appeal flyer. We were using anonymous patient quotes in conjunction with a photo of a nurse and child. For legal reasons, we did not want people to associate the quote with a photo of an actual patient from our photo library. In this case a stock photo was best. I’m just glad it did not cost a lot. The other benefit of istockphoto is that photographers can upload and sell thier photos as stock photos. Like I say, it’s a true Web 2.0 site. It’s an eBay for stock media. You never know, it could be an additional source of revenue. Has anyone else used this site? Do you know of similar sites?